When their baby boy was born deaf parents Jemma and Ben were devastated knowing their son would never be able to hear. But the couple recently had the happiest moment of their life when baby Oliver reacted to the sound of a drum beat and it was all thanks to a pioneering surgery in Italy. Oliver Bosch was born without vital nerves in his ears which meant he was unable to hear and even the most advanced hearing aids could not help. Jemma and Ben, his parents, were told that the only hope to give Oliver a sense of hearing was through an advanced surgery in Verona, Italy. The problem? The surgery was £60,000. The couple had less than six months to raise the huge amount as the window of when the procedure could really be of use to Oliver was small. Doctors said the kind of procedure required on Oliver is less effective once the child turns more than two years old as then their brain is already used to deafness. The couple began raising the money and last month thanks to a single mystery donation of £30,000 and other donations, surgeons could fit 19-month-old Oliver with a special electronic device to stimulate his brain stem. Oliver was operated at the University of Verona Hospital by top surgeon Vittorio Colletti. The device is known as an auditory brainstem implant and for Oliver’s family it was a benefit. The moment the device was switched on Oliver instantly reacted to the sound of a banging drum. The mom also fears the outcome if they could not have managed to get Oliver to Italy on time. ‘We’ve been on quite a journey and we both know that if we’d waited just a few more months it could have been a different story as it might not have worked. 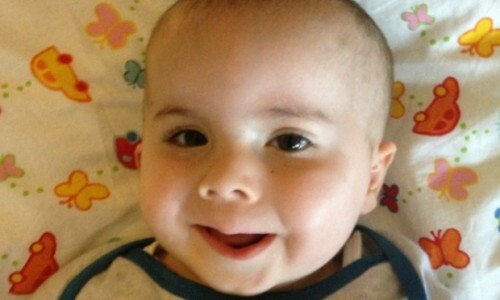 Oliver was born in July 2011 and it was just after four months that doctors discovered he was deaf. They thought at the time though that the baby boy would be able to hear with the help of hearing aids. The parents were devastated when the tests revealed that was not to be the case. Oliver’s auditory nerves were missing completely therefore hearing aids would not help. The news of the surgery in Italy did fill them with hope. Oliver underwent surgery on February 26th and the auditory brainstem implant was activated on March 26th. There are 12 electrodes in his brain that will help him interpret sounds. Doctors are confident that he will be able to communicate fully and easily as he gets older. There are years of speech therapy sessions needed though. Oliver could be holding normal conversations before he reaches school age and that is a giant step.